When confronted with such a cool bird as an owl, it is very tempting to go straight for the close-up, head-on image(s). Nothing wrong with that at all, and I am in the same boat as most when getting mesmerized by these amazing animals. 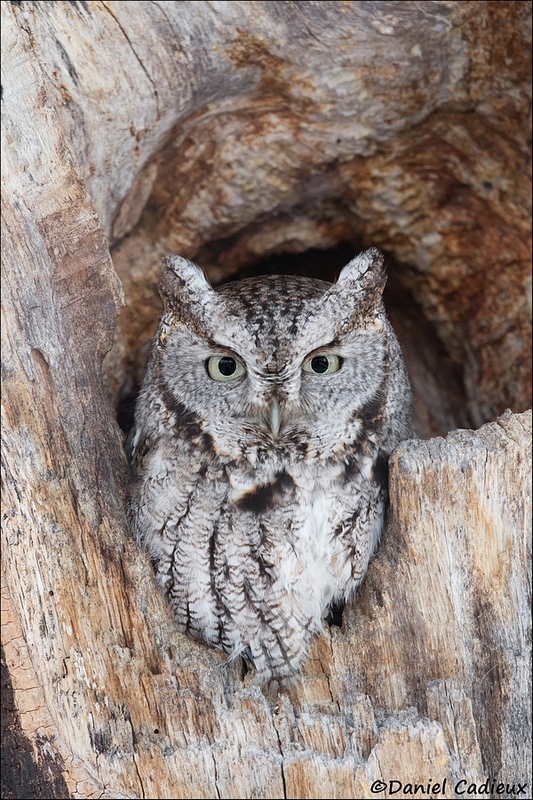 Case in point, see this picture I took of an Eastern Screech-Owl. Perfectly down-the-barrel, and as an added bonus, sitting in a pretty gnarly roosting hole too. 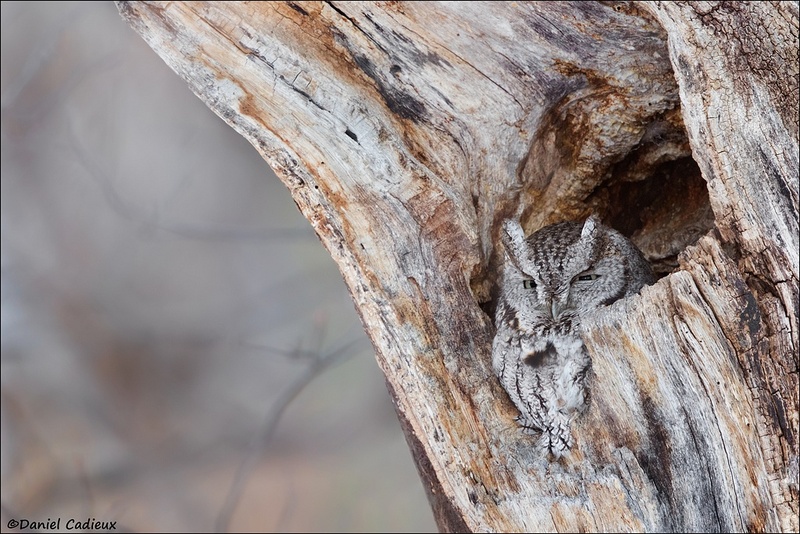 Eastern Screech-Owl, Canon 7DII + 500mm f/4 II + 1.4TC III, manual exposure, evaluative metering, 1/320s., f/5.6, ISO 1600. Most would be happy with only this frame in the bag, and perhaps a few other very similar ones, and head home with a smile. I know I would…but there is more to be had by simply moving around! 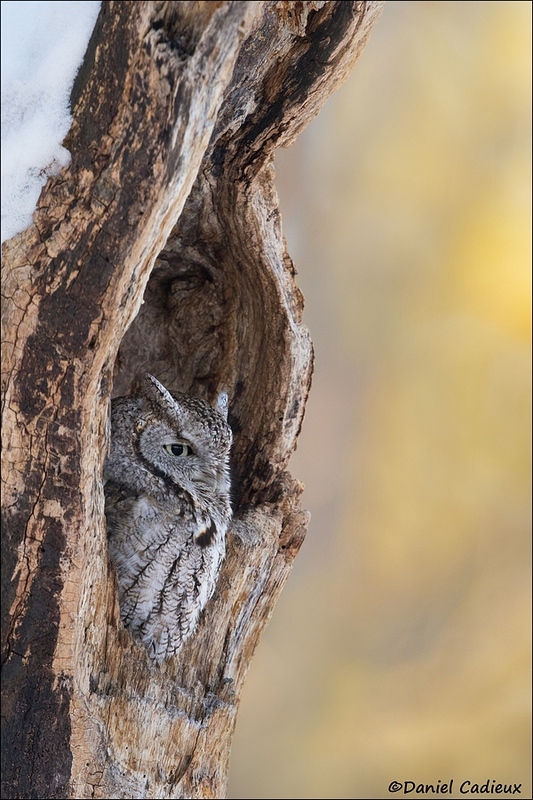 This screech owl was going nowhere, so I took the opportunity to walk around and see what other options I had to photograph this excellent subject. First, moving way back and to my right. Once I had the distance I was happy with, I needed to watch out for background distractions. Moving up, down, left, right, just a few inches either removed or introduced elements into the frame. Once happy with the background and overall angle I waited for the owl to look elsewhere than directly towards me. Eastern Screech-Owl, Canon 7DII + 500mm f/4 II + 1.4TC III, manual exposure, evaluative metering, 1/160s., f/5.6, ISO 1600. Then I walked a very wide arc to my left to see what type of opportunity there was from the other side of the tree. Once there I noticed how impressive the cavity was around and above the owl, therefore I flipped my camera to create a few verticals to take advantage of all that beautifully weathered roosting hole. Once again I needed to move up, down, left, right just a few inches at a time to make sure the background was free of distractions – either unwanted branches, or ugly highlights. There was only a thin window of movement that allowed the yellows to cover the majority of the background, and I worked all possible movement tweaks to make sure those were in. After having attained the perfect angle I created a few more frames, with this one my favorite from that side of the tree, and my overall favorite of the session with this owl. The lesson here, when you have a cooperative subject, is to not just find the best spot and then glue your feet there. Note the very same focal length used in the three images, I had to use my feet! Walk around, back, forth. Take some verticals, horizontals. Close ups, wider views. Look for different backgrounds, point of views, angles. What I like here is that in three images I have three totally different views and angles of the subject. All from the same session, and same perch, but three very different images with differing colours (when a distant background was included). Doing this also helps hone your skills and keep the creative juices flowing. Not all images will work or turn out the way it felt at that moment in the field, but the rewards far outweigh the alternative! I agree with Ross Dan. All the shots are great but the last one tops them all with the composition and sweet colour, out of focus bokeh. Glad you like it Stephen! Owls are great aren’t they! I’m sure you’ll get your chance at some point. Glad you liked the tips! Nice article Daniel! Good tips on finding different perspectives. Very nice article. I agree with Ross that everything come together on the last image. Combining the tack sharp main subject (owl) and the dreamlike soft background, you have made a great image. It tells a very nice story about the owl’s habit. Once I was in a slot canyon in southwest US, the location is amazing itself, but I found an owl perched above on a rock, I spent the entire day taking pictures and trying out different perspectives in order make to a story about these beautiful birds. In the meantime, I forgotten about the rest of the landscape. Thank you Joe, glad you like it. That must have been one sweet day you spent with that owl!